The touchdown on the red neighbor planet is one of the most difficult endeavors of space travel. The NASA robot “InSight” landed on Mars. 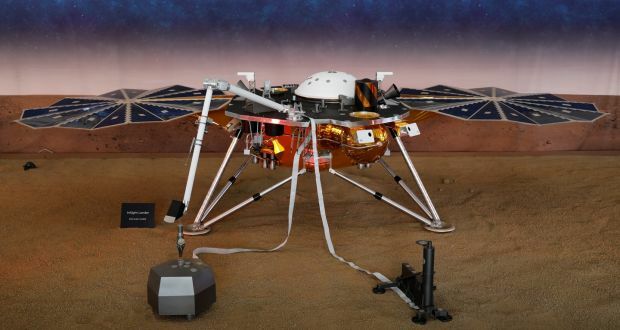 After a journey of approximately 485 million kilometers, the lander launched “InSight” in May on Monday in the Elysium Planitia plain north of the Mars equator on the red planet, according to the US space agency Nasa. “Landing confirmed!”, Said the US space agency from its control center in Pasadena, California. There, jubilation erupted, scientists sprang up from their seats and hugged each other. First Mars shot of “InSight” after landing. Whether the robot is fully functional, was not clear yet. After entering the Martian atmosphere, the robot was lowered in a very complicated maneuver with the help of rockets and a parachute. The 360-kilogram “InSight” robot can not roll but stays in one place. With numerous scientific instruments, the robot is to study Mars and above all to learn more about the structure of the planet and the dynamics under its surface. A device developed in Germany, a kind of Mars mole, is supposed to drill into the ground. The total of around 650 million euros expensive mission is designed for two years. The Graz Institute for Space Research (IMF) of the Austrian Academy of Sciences is involved in the evaluation of the data. Last Nasa 2012 had brought the rover “Curiosity” successfully on Mars. Landings on the red planet are considered extremely difficult – only about 40 percent of all previously launched worldwide Mars missions were successful according to NASA. The US is the only country that has managed to sell working research robots on Mars.